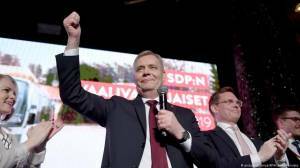 Finland's center-left Social Democratic Party was on pace to narrowly win parliamentary elections on Sunday, according to preliminary results after more than 99% of votes were counted. Prime Minister Juha Sipila's Center Party took 13.8%. Social Democrat leader Rinne said: "For the first time since 1999 we are the largest party in Finland ... SDP is the prime minister party." "Let us, my friends, take the Finnish society toward sustainable climate, social and economic policies," he told supporters. "The Center Party is the biggest loser in these elections. This result is a big disappointment for us. I want to congratulate the winners," he said. Finns Party chairman Jussi Halla-aho, who received the most votes of any candidate, said he was surprised his party did so well. "I certainly could never have expected a result like this," Halla-aho said. "Honestly speaking, none of us expected this kind of result." 200 seats were up for grabs in the Eduskunta parliament. The Finns Party secured 39 seats. It won one additional seat compared to 2015, before a split that saw more than half of the party's lawmakers leave the parliamentary group. Two smaller parties, the Swedish People's Party of Finland and the Christian Democrats, won 9 and 5 seats, respectively. Finland is set to take over the rotating EU presidency on July 1. European capitals were watching the performance of the Finns Party, which saw its support surge in the run-up to the vote. Many observers expect similar euroskeptic and nationalist parties make strong gains in next month's EU parliamentary elections. The Finns Party is part of a nationalist bloc of European parties aiming to challenge EU policies on migration, security, family and environment. Only 6.6% of the population is foreign-born, the lowest rate in Western Europe. Until recently, immigration was only a minor election issue. However, the Finns Party has attracted voters from small towns and villages worried about the issue, especially following highly publicized incidents of alleged sexual assaults by migrants last year. Other party leaders have cautioned against anti-immigrant rhetoric and generalizations about migrants. Rinne supports moderate work-related immigration and taking in some asylum-seekers. Read more: Climate protection - where do the EU's right-wing populists stand? Most parties support efforts to combat climate change, but they differed during the campaign on how far to go and at what cost. The Finns Party used the debate as a wedge issue to attract voters skeptical of the costs of further action.